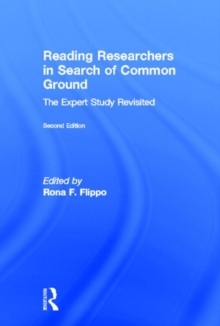 In Reading Researchers in Search of Common Ground, Second Edition, Rona F.
Flippo revisits her groundbreaking Expert Study, in which she set out to find common ground among experts in the much-fragmented field of reading research. The original edition, featuring contributions from participants in the Expert Study, commentary from additional distinguished literacy scholars with specialized experiences and vantage points from which to view it, and recommendations for use of its findings, was published in 2001 and has become a classic in the field. The Expert Study's findings and discussions related to it remain provocative, viable, and highly relevant. Taking a fresh look at it, and its current implications for literacy education and common ground in light of the newest thinking and research of today, the Second Edition includes four new chapters from leaders in the field who discuss the Study from their unique vantage points (literacy trends, emergent writing development, a comprehensive literacy curriculum, and a comparative analysis of the study's findings and recommendations). It is a must-read resource for the entire literacy community researchers, teacher educators, graduate students, administrators, practitioners, and policymakers.